Here at Cheap-price.net we have Eldest (Inheritance, Book 2) at a terrific price. The real time price may actually be cheaper- click on the 'Buy Now' above to check the realtime price of Eldest (Inheritance, Book 2) at Amazon.com. Surpassing its popular prequel Eragon, this second volume in the Inheritance trilogy shows growing maturity and skill on the part of its very young author, who was only seventeen when the first volume was published in 2003. The story is solidly in the tradition (some might say derivative) of the classic heroic quest fantasy, with the predictable cast of dwarves, elves, and dragons--but also including some imaginatively creepy creatures of evil. The land of Alagaesia is suffering under the Empire of the wicked Galbatorix, and Eragon and his dragon Saphira, last of the Riders, are the only hope. But Eragon is young and has much to learn, and so he is sent off to the elven forest city of Ellesmera, where he and Saphira are tutored in magic, battle skills, and the ancient language by the wise former Rider Oromis and his elderly dragon Glaedr. Meanwhile, back at Carvahall, Eragon's home, his cousin Roran is the target of a siege by the hideous Ra'zac, and he must lead the villagers on a desperate escape over the mountains. The two narratives move toward a massive battle with the forces of Galbatorix, where Eragon learns a shocking secret about his parentage and commits himself to saving his people. 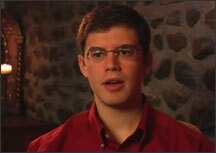 Christopher Paolinis abiding love of fantasy and science fiction inspired him to begin writing his debut novel, Eragon, when he graduated from high school at age 15. 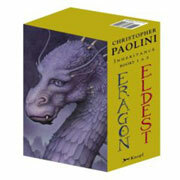 Paolini talks more about the series, and about what inspires him in this video clip. Our quickie pronunciation guide will help you get to know some of the names and places in the Inheritance series. 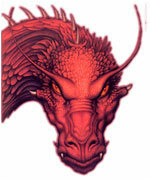 ARE-jet-lahm Elven word to describe Dragon Riders meaning "silver hand"
I love the social commentary! Great book! Engaging enough to finish in one day. I love what appears to be the social commentary throughout the book (i.e. critical thinking vs. superstition & the lack of appreciation for that which is too easily gained). A great read! The only thing I'm annoyed about is having to wait for book 3. >All in all, I liked the book. I feel that in the long run all the seemingly overdone detail and explanations provided in this book will very helpful in book 3. I could be wrong though I hope not. It wasn't that boring either, you had Rorans adventure and there were a few action scenes during Eragons training. One last thing, for all the people who claim he is a Tolkien rip off I have one question. How do you write a epic adventure with dwarves, elves, dragons, etc.. without borrowing ideas from Tolkien b/c he pretty much covered most everything!